As I am sure some of you have noticed, this site has been silent for a while as I have been traveling – and shooting non-stop since early July. I was covering different photographic subjects in Oregon (my favorite state in the US), NYC, Florida, Scotland (on the island of Skye). I am now in South Brittany (France) covering a very original festival ( more on this early next week). 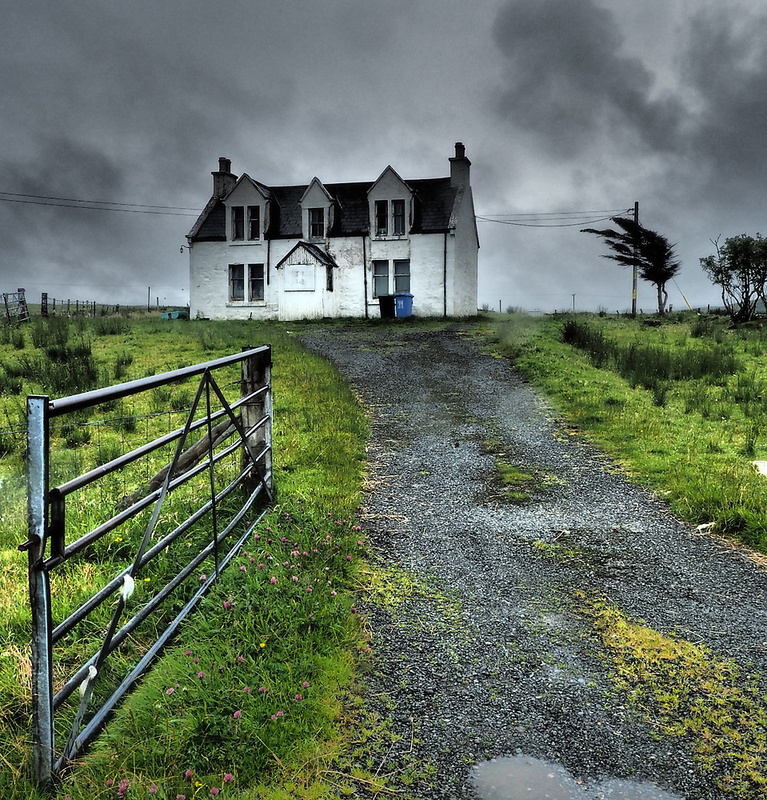 Today, I want to cover my trip to Scotland to discuss making photographs in “bad weather”. I had been to Scotland once before but this was my first time in Skye. 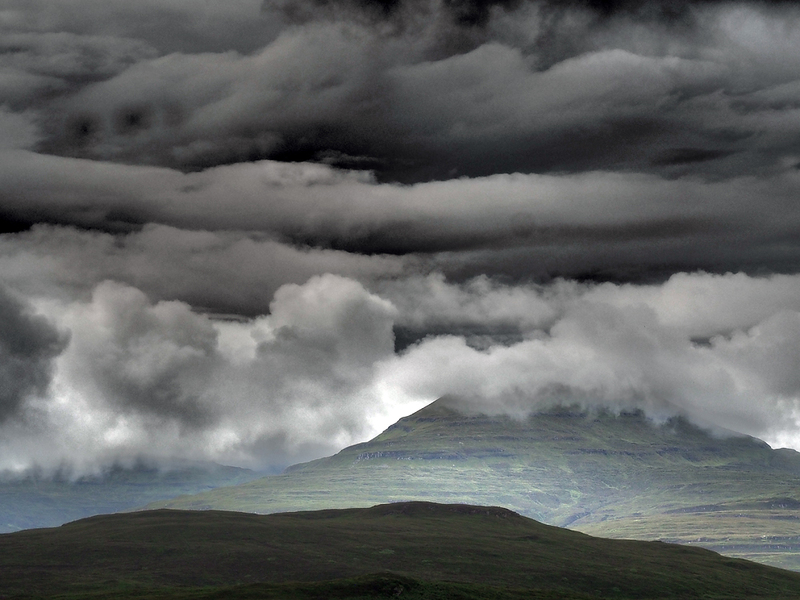 In Scotland, it is a known fact that the weather can change very quickly, especially in the summer months and one knows that any extended say in Scotland (say over a week) is going to mean, at some point, some rain showers. That being said, I did not expect that amount of grey skies and rain showers in August. Speaking to several locals in different parts of the island I was told that this summer had been particularly ungrateful which brings me to the subject of this article : As a landscape photographer how can one still get back with enough good images when light is less than ideal for most of the daytime ? In two words : patience and adaptability. I had a little more than 8 days to explore the island of Skye which should have been enough to cover several sections of the island. In the end , I probably covered about 2/3rds of what I expected because I allowed for some extra time “waiting for the right light”. The image above would not have made sense but for the mood created by the dramatic line and I had to wait through two short rainstorms to get the light to come out. Of course, as I write those lines I realize that it is a luxury that many people cannot have because they are not traveling solo or are unable- or unwilling- to forego part of the plan to get the pictures just right. This part of Scotland was extremely busy with tourists it turns out. Hearing some of them talk about their “contingency plans” I was fascinated to understand how many of them have such a tight schedule that there is hardly any wiggle room in vase of unexpected delays …or simply bad weather. Each to his own of course but for the avid photographer, I would like to suggest allowing extra time in their schedule to gain some flexibility. It would probably show better on a print than on your screen but several of the images accompanying this article would look very dull if I did not wait for some light to come back. The Scottish landscape features lots of mountains, waterfalls , rivers, lochs and only a certain light recreates the magic beauty of the scenery so it requires the photographer to be ready. Let’s just say that, as you are driving on the road, you noticed a photogenic scenery. 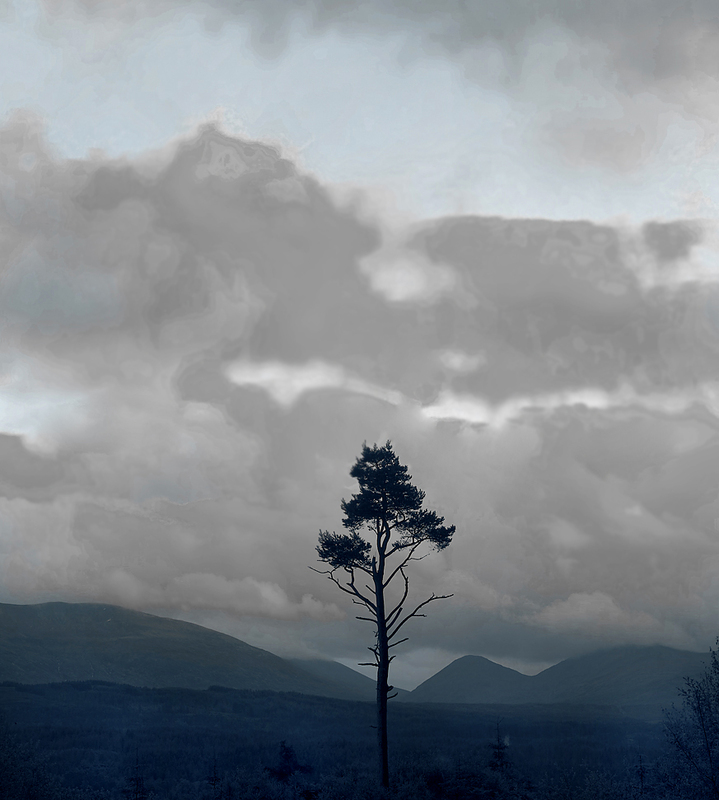 You stop the car (fortunately there many small spots on Scottish roads to do that) and walk to find your viewpoint. At that time, the sky is grey and the light is flat. If you think the light might change, however briefly, my advice to you is do not wait to get ready. Pick up the camera lens combination which you think works best for the image you want to create, set up your tripod and check the levels if you are not going to shoot hand held. Do not wait to get ready. The light could be back only for a few minutes and you do not want to miss that opportunity because you were still trying to decide which lens/ filter/ tripod height ( take your pick) you want to use. photographing in those weather conditions is very much like shooting at sunset you know you only have a few minutes to get the ” right light” for your image.with one notable caveat you cannot predict at which time the great light will be back. For the picture of the tree above, I spent twenty minutes hesitating between a few spots on the side of a very muddy road. I had narrowed it down to two exact spots which I marked the ground on with my boots so that when the light came back i would be able to switch from one to the other in a matter if 30 seconds or so. The light came through the clouds for maybe two minutes total and I was able to get the image I wanted because I did all the prep work while the light was dull. Having weather sealed material is a advantage in such weather but one should be able to get by with minimum care and some ingeniosity.The photographer must take care of keeping himself, or herself dry. Being completely drenched is not going to help you to keep your attention on the subject. Another point I want to discuss is the lack of thought when photographing a popular site. 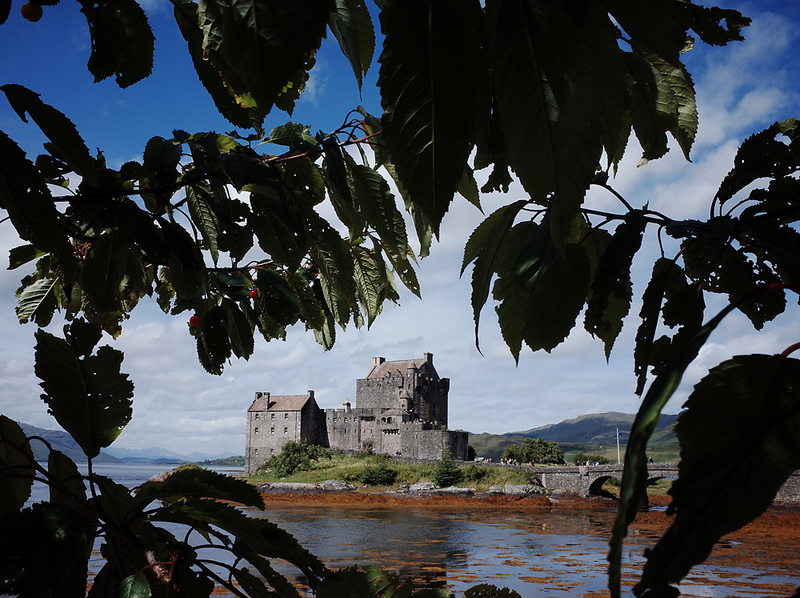 Case in point on this trip was my visiting the Eilean Donan castle in Dornie (South of Skye). This castle is indeed very picturesque and thousands of visitors stop by every day during the summer monthes. And yet, 99% of visitors seem keen on taking the same picture. People tend to forget that an image on paper or on screen is not three dimensional and produce images that will look very flat. A good way to avoid this is to include a foreground when photographing the large main subject in the background. Here, I just positioned myself under a nearby tree to frame my main subject with leaves and make it a little more interesting. Point is, even when you have limited time to spend on a given site, take a few extra minutes to look for the best viewpoint for the image. Often it is likely NOT to be the one where most tourists gather. Furthermore, when photographing a popular site, it sometimes require a lot of patience to wait until you do not have any disturbing silhouettes in the frame.